$35.96 $44.95 As Low As $0.24 ea. 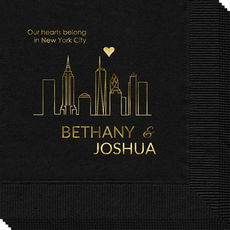 Set of printed guest towels featuring the New York City skyline. Your choice of guest towel color and imprint color. Quality 3-ply guest towels you'll be proud to use or give. Approximate size 4.5" x 8". Typestyle and positioning only as shown. Guest Towels are shrink wrapped in sets of 50. Wording "Our hearts belong in New York City" will always appear as shown. Sample shown in Black Napkin using Gold Metallic Foil Imprint. Will be printed in typestyle as shown. Ampersand will always appear between names as shown.